The Barn at Stratford as it faces Stratford Road. The barn was built in 1848 and donated to the Delaware County Historical Society in 2010. The floors and support beams have been re-done inside the barn, which has become a very popular place to have weddings and receptions. 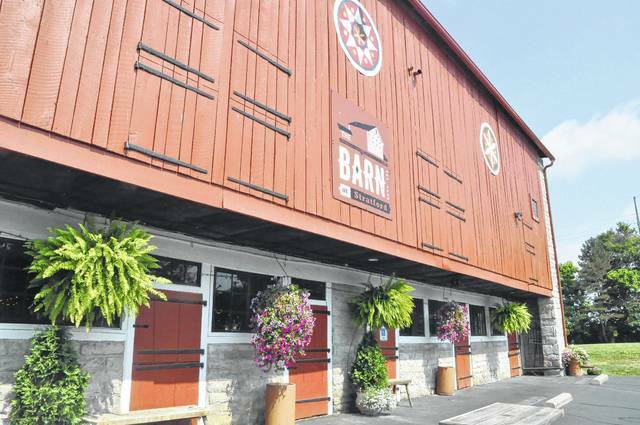 The Barn’s venue manager, Connie Hoffman, said it is booked every weekend for the rest of the year for weddings. Venue Manager Connie Hoffman said the size of the property gives wedding parties a variety of locations to hold the ceremony and to take photos including a historic gazebo (at right) and several large trees. The Barn at Stratford has found new life under the leadership of the Delaware County Historical Society. The barn was built in 1848 and when it was donated to the historical society in 2010, it was in need of major renovations, said Connie Hoffman, the venue manager. Hoffman explained that the barn needed new paint, floors, support beams, and numerous other renovations, and said the historical society has been raising money to install a new HVAC system. Regardless, the 169-year-old structure has become a very popular wedding venue. Hoffman said a wedding is booked practically every Saturday for the rest of the year. She said weddings have been held at numerous spots on the property, including a historic gazebo and underneath a large willow tree. 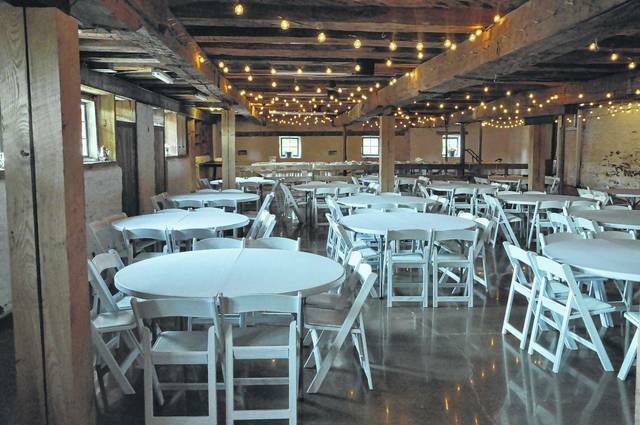 With a seating capacity of 175, the barn also is ideal for wedding receptions, Hoffman said. “Brides love it here,” she said. 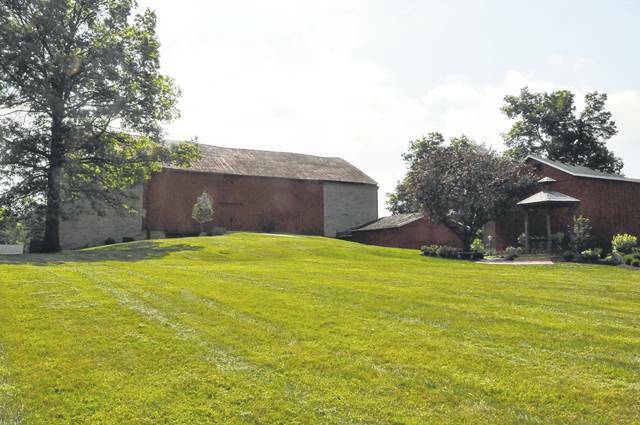 Since 1991, The Barn at Stratford has been listed on the National Register of Historic Places, said Donna Meyer, the executive director of the Delaware County Historical Society. Earlier this year, the Ohio General Assembly unanimously passed a bill designating barns as the official historical architectural structure of Ohio. Hoffman said in addition to installing a new HVAC system, the historical society also is planning to renovate the kitchen space, which currently can only be used by caterers and cannot have any food prepared in it. Hoffman hopes the continued renovations will attract corporate retreats and other business functions. Hoffman added that The Barn already has benefited from the Columbus IKEA after the business bused employees to The Barn for a lunch event. “In order to make it successful, we need to build up the Monday through Thursday business,” Hoffman said. Hoffman said the venue is used for educational tours and monthly historical society programs such as the upcoming Family Photos Old and New event on July 27 at 7 p.m., when a program will be presented about preserving old photographs. For Hoffman personally, the barn is about leaving a legacy. Hoffman added that the historical society launched a capital improvements campaign last year called “Our History, Our Heritage” to pay back loans that were obtained for various improvements. Hoffman said the campaign currently has about $42,000 of the desired $300,000 and is still accepting donations. The campaign also will pay for improvements at the adjacent Meeker Homestead Museum and The Cryder Historical Center on East William Street. More information about the capital campaign can be found online at www.delawareohiohistory.org. Information about The Barn at Stratford, including booking information, can be found at www.barnatstratford.org/ or by calling 844-369-2276. This entry was tagged delaware county historical society. Bookmark the permalink.